Yes, that’s right. One particularly well-documented case occurred during Abraham Lincoln’s presidency, when the President’s wife, Mary Todd Lincoln, invited a noted trance medium, Nettie Colburn Maynard, age 21, to hold a séance in the White House and to meet the President. 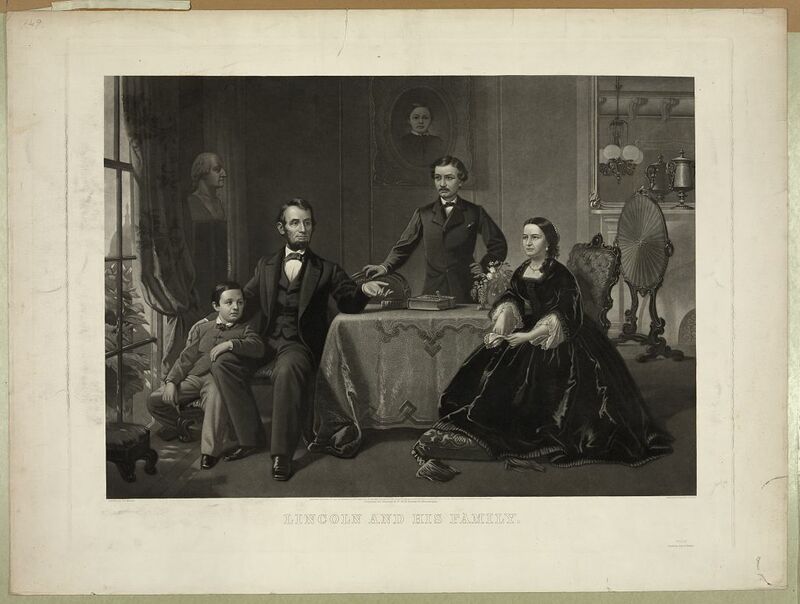 Abraham, Mary and their two surviving sons, Robert and Thomas "Tad" Lincoln. A photo of Willie, who died at age 11, is on the back wall. Now, it should be understood that Nettie Colburn Maynard worked as a trance medium, enabling Spirit to speak directly through her to the President. While in trance, Ms. Maynard was unaware of what had been said through her voice. The following is Ms. Maynard’s fascinating personal account of this experience, drawn from her book published in 1917, Was Abraham Lincoln a Spiritualist? : Or, Curious Revelations from the Life of a Trance Medium. I was led forward and presented. He stood before me, tall and kindly, with a smile on his face. Dropping his hand upon my head, he said, in a humorous tone, “So this is our ‘little Nettie’ is it, that we have heard so much about?” I could only smile and say, “Yes, sir,” like any school girl; when he kindly led me to an ottoman. Sitting down in a chair, the ottoman at his feet, he began asking me questions in a kindly way about my mediumship; and I think he must have thought me stupid, as my answers were little beyond a “Yes” and “No.” His manner, however, was genial and kind, and it was then suggested we form a circle. He said, “Well, how do you do it?” looking at me. Mr. Laurie came to the rescue, and said we had been accustomed to sit in a circle and join hands; but he did not think it would be necessary in this instance. While he was yet speaking, I lost all consciousness of my surroundings and passed under control [of spirit]. For more than an hour I was made to talk to him, and I learned from my friends afterward that it was upon matters that he seemed fully to understand, while they comprehended very little until that portion was reached that related to the forthcoming Emancipation Proclamation. He was charged with the utmost solemnity and force of manner not to abate the terms of its issue, and not to delay its enforcement as a law beyond the opening of the year; and he was assured that it was to be the crowning event of his administration and his life; and that while he was being counseled by strong parties to defer the enforcement of it, hoping to supplant it by other measures and to delay action, he must in no ways heed such counsel, but stand firm to his convictions and fearlessly perform the work and full the mission for which he had been raised up by an overruling Providence. Those present declared that they lost sight of the timid girl in the majesty of the utterance, the strength and force of the language, and the importance of that which was conveyed, and seemed to realize that some strong masculine spirit force was giving speech to almost divine commands. A gentleman present then said in a low tone, “Mr. President, did you notice anything peculiar in the method of address?” Mr. Lincoln raised himself, as if shaking off his spell. He glanced quickly at the full-length portrait of Daniel Webster, that hung above the piano, and replied, ‘Yes, and it is very singular, very!” with a marked emphasis. Mr. Somes said: “Mr. President, would it be improper for me to inquire whether there has been any pressure brought to bear upon you to defer the enforcement of the Proclamation?” To which the President replied: “Under these circumstances that question is perfectly proper, as we are all friends smiling upon the company. It is taking all my nerve and strength to withstand such a pressure.” At this point the gentlemen drew around him, and spoke together in low tones, Mr. Lincoln saying least of all. At last he turned to me, and laying his hand upon my head, uttered these words in a manner that I shall never forget: “My child, you possess a very singular gift; but that it is of God, I have no doubt. I thank you for coming here to-night. It is more important than perhaps any one present can understand. I must leave you all now; but I hope I shall see you again. He shook me kindly by the hand, bowed to the rest of the company, and was gone. We remained an hour longer, talking with Mrs. Lincoln and her friends, and then returned to Georgetown. Such was my first interview with Abraham Lincoln, and the memory of it is as clear and vivid as the evening on which it occurred. It’s not surprising to me that President Lincoln should be attending his first, and perhaps only, séance (whether out of curiosity or in efforts to please his wife, we’ll never know) and then be the one to receive such an evocative and powerful message from Spirit—not from his sons, as was expected, but rather from a Spirit Guide bearing a message of strength and encouragement that he needed at that moment in time. I see it so often in this work. We believe we are going to have one experience or to hear from a particular person in Spirit about a particular topic, but Spirit, given the opportunity, turns it into something else altogether, and that something else turns out to be more important, more significant in the end than what was initially sought or hoped for by the Sitter. Why? Because Spirit has the big picture—they know our past; they see our future’s most probably path; they see the potential impact of future actions, and they do their best to communicate what we need to keep moving in the direction we’ve pre-determined we want to go in this lifetime. That President Lincoln was asked by Spirit to not buckle under pressure and to maintain his resolve to not defer the Emancipation Proclamation may have ensured the history we know today. If he had not received this message, would he have deferred? And if he had deferred, what would that have meant to our divided country? How much longer would racial injustice have prevailed in this country? Who knows? We only know what happened, and by this account (corroborated by several others present) that Spirit found a way to the President of the United States at that most critical juncture in our country’s history. Historian Dr. Mark Noll states that “Lincoln never joined a church nor ever made a clear profession of standard Christian belief.” During the White House years, however, he often did attend the New York Avenue Presbyterian Church, where the family pew he rented is marked by a plaque. Noll agrees with biographer Jesse Fell that Lincoln rejected orthodox views. Lincoln did not believe in the divinity of Jesus, the Atonement, the infallibility of the Bible, miracles, or heaven and hell. Noll argues Lincoln was turned against organized Christianity by his experiences as a young man who saw how excessive emotion and bitter sectarian quarrels marked yearly camp meetings and the ministry of traveling preachers. The one aspect of his parents’ Calvinist religion that Lincoln apparently embraced wholeheartedly throughout his life was the “doctrine of necessity,” also known as predestination, determinism, or fatalism. It was almost always through these lenses that Lincoln assessed the meaning of the Civil War. What is interesting in this overview of what Lincoln did or did not believe is that it closely mirrors the Spiritualist Philosophy. So, was Abraham Lincoln a Spiritualist? I’ll have to read Nettie Colburn Maynard’s book to see the conclusion she drew, but after what I’ve learned in my cursory research, I’d have to say, “Unlikely.” Attending a few séances does not a Spiritualist make, nor is Spirit Communication the domain of Spiritualism by any means. Now, would President Lincoln have found common Spiritual ground with Spiritualists and/or Universalists? Yes, he would have, but does it matter? He was guided by a strong ethical compass and deep Spiritual convictions. He allowed himself to be open-minded to all possibilities, and for that, and all that he was, we respect him as one of the greatest American Presidents of all time. 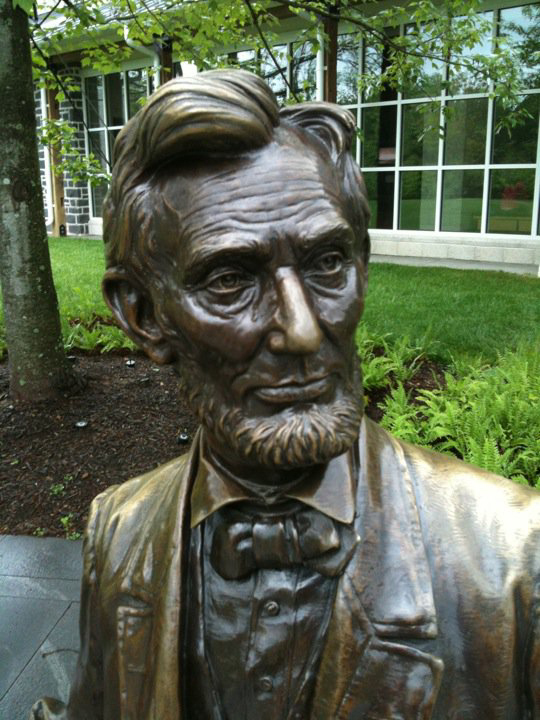 Life-sized bronze statue of Abraham Lincoln at Gettysburg National Military Park & Museum. As an aside, last summer I had the opportunity to stop and visit the Gettysburg National Military Park and Museum situated near the Gettysburg battleground. As I walked up to the museum, I stopped to study a full-size bronze statue of Abraham Lincoln, sitting on a bench. It had been raining that morning, but everything had dried…except for one drop, which lay on his right cheek like a single tear. At first I thought it was part of the statue, because everything around the statue was dry, but when I looked closer, I could see that it was indeed water. I was touched by it, but not until I walked through the exhibit, choking back my own tears at display after display of human carnage and suffering, did I have even a glimmer of understanding of the depth of President Lincoln’s sorrow during his final years. Does he still shed a tear for the divisions in our world? For what we’ve lost due to misguided ideologies? As I write this blog post, I can’t help but wonder if President Lincoln has elected to continue his work from Spirit with our living Presidents, guiding them to follow their hearts and minds, and to not buckle under political pressure when difficult decisions are necessary—as his Spirit Guide did for him. I am comforted by the idea that he may be watching over and guiding President Obama, who symbolizes for many of us, within a single soul, what the Civil War was all about. Whew. That got a little heavy, didn’t it? You can’t talk about Abraham Lincoln without thinking of slavery, the Civil War and the powerful way in which President Lincoln’s beliefs and resulting decisions dramatically altered the course of history–our history. As we send out our heartfelt gratitude to the Spirit of Abraham Lincoln, and come back to the present, an opportunity awaits. Have you ever wanted to participate in a Spirit Circle or Séance, but never had the occasion? Well, the good news is that the tradition of the Spiritualist Séance continues today. If you are in the Boston area and would like to participate in one, you have a chance in the near future to do so! For the first time in over a decade, the Swampscott Church of Spiritualism is holding a public Victorian Séance on Saturday, February 18th, from 2:00-5:00pm. I’ll be there, leading one of the eight tables, so be sure to introduce yourself. And don’t delay–tickets are limited! “Seance Room.” It was obvious that the room must have been frequently used. P.S. How is Marta doing? I didn’t know there was a designated “Seance Room.” Interesting! So you’re right–there must have been a series of seances at the White House. It’s not surprising. Mary Todd Lincoln seemed to be quite an active Spiritualist her entire life–with so many losses, I’m sure she found comfort within it. Thanks for commenting. Do you mean daguerreotype? And of what? The medium at the White House?